UPDATE: Oj & Dozer are still available for adoption. RACC is open today (Sunday) from 12-4pm. This might be the cutest (and saddest) thing you see today. 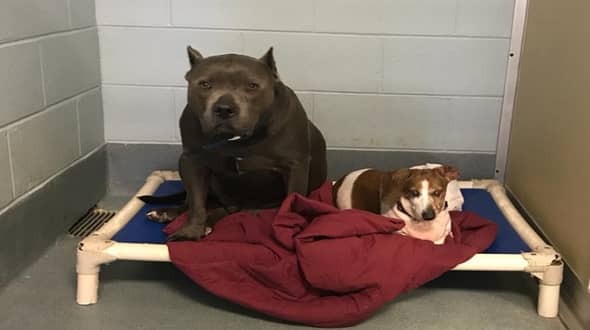 Meet Blue Dozer (pit, 6 yr) and OJ (doxy, 12yr)-they were surrendered to RACC because their owner became homeless and is unable to provide care for them. These bonded best friends need to be adopted together. OJ is blind and depends on Dozer to show him around. We can’t stand the cuteness and kindness these two share. Anyone willing to love a bonded pair of perfection? They are both heartbroken and could really use a caring, loving home! they will only be adopted together. Please consider opening your heart and home to these two! They are very "laid-back", no trouble at all! 12 Responses to "A blind dog and his guide surrendered at the shelter. this is cutest (and saddest) thing to see today"
Sharing for these two beautiful dogs who need HELP now....bonded and ready for a new home!! Please give them a chance at a new life!!! There are several organizations for homeless people with pets and one for blind dogs--someone out there--please make an effort to contact them. Also, if it gets on local tv, there will be help and donations. It takes much pr to get dogs like this helped and saved. I so agree Connie! It needs to be on the local TV quickly! awww.. you are sweet. its not annoying.. and you said it all straight forward with out bashing people who may have not been able to keep them respectivly.. bless you. It is my understanding that they were adopted together and then the blind JRT was dumped over 100 miles away, alone. Adopter did not give shelter any info on the Pit. Waiting for update. Oh noooo!! Are they trying to find the poor baby?? Horrible! I hope that's not correct.